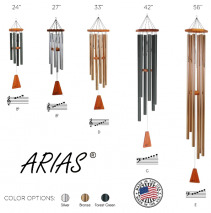 ARIAS® wind chimes are hand crafted from anodized aluminum and finished redwood. All of our chimes are musically designed for clear melodious tones and long lasting beauty. ARIAS® wind chimes are proudly made in the U.S.A.! We offer 5 different sizes and 3 different colors of ARIAS® wind chimes. Prices range from $45.99 to $84.99, depending on the size of the chimes. Colors: Silver, Bronze, and Forest Green. Sizes: 24" with 4 tubes, 27" with 6 tubes, 33" with 6 tubes, 42" with 6 tubes, and 56" with 6 tubes. Available for local delivery only. Cannot be wired out, as not all florists carry this item. Subject to availability. Please call us to order this item. 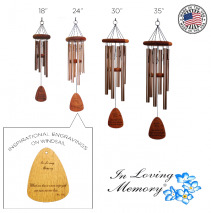 In Loving Memory® wind chimes combine exceptional sound, traditional style and inspirational engraving to provide a wonderful remembrance or memorial tribute to loved ones. Please call us for more details on which windsail messages are currently available for the size of wind chimes you would like. These wind chimes are proudly made in the U.S.A.! We offer 4 different sizes of bronze In Loving Memory® wind chimes. Prices range from $43.99 to $83.99, depending on the size of the chimes. Sizes: 18", 24", 30", and 45". All In Loving Memory® chimes have 6 tubes. Available for local delivery only. Cannot be wired out, as not all florists carry this item. For a list of windsail messages we offer, please visit http://bit.ly/2j7H9o8. Subject to availability. Please call us to order this item. 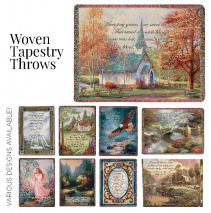 We offer a large selection of tapestry throw designs and verses. Not all designs pictured. Please call for pricing and more details. Available for local delivery only. Cannot be wired out, as not all florists carry this item. Subject to availability. 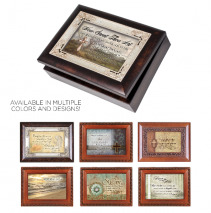 This product is available in a variety of different box colors and designs. We also offer a selection of various tunes. Our music box lids showcase different images/text, or you may add your own. All styles not shown in photo. Please call us for pricing and assistance in ordering. Available for local delivery only. Cannot be wired out, as not all florists carry this item. Flowers convey a message that cannot be put into words. BUD AND BLOOM SOUTH INC. of Franklin, IN provides a variety of fresh, fashionable floral designs to ensure that your gift is one of elegance and beauty. When you're looking for a unique hostess gift, token of appreciation or just a surprise to brighten someone's day, let BUD AND BLOOM SOUTH INC. customize and deliver one of our many fun, decorative & luxury gifts! We create dazzling presentations that are sure to please for any gift-giving occasion. To get your custom gift items, come by and see BUD AND BLOOM SOUTH INC. - your local Franklin, IN florist.